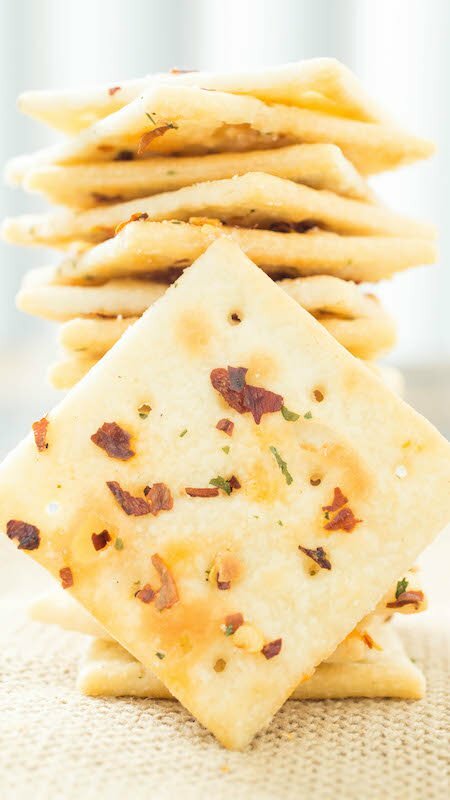 This recipe takes Saltine crackers and seasons them with ranch, red pepper flakes, and garlic. A delicious, easy-to-make snack! I found this recipe while perusing Pinterest and thought to myself, “What an easy little snack”. Saltines by themselves don’t really do much for me, but add some flavor to them and I’m on board. These can be addictive though so be careful. If I were to make these again, I think I’d try using oyster crackers. They’re more bite-sized and easier to pop in your mouth. Although I guess that could be dangerous as well…..either way…delicious! Place two sleeves of crackers into each Glad container. In a bowl, mix oil, ranch dressing mix, red pepper flakes, and garlic powder. Continue to stir the mixture. You don’t want the red pepper flakes to settle. Drizzle half the mixture into each container, over the crackers. Put lids on the containers and turn upside down every 5 min. for 30 min. Will keep for up to a week. I love these! I usually make them on 4th of July week for snacks and use all the tiny baby crackers of each kind! The folks at work love these large ones with Chili! Yum! 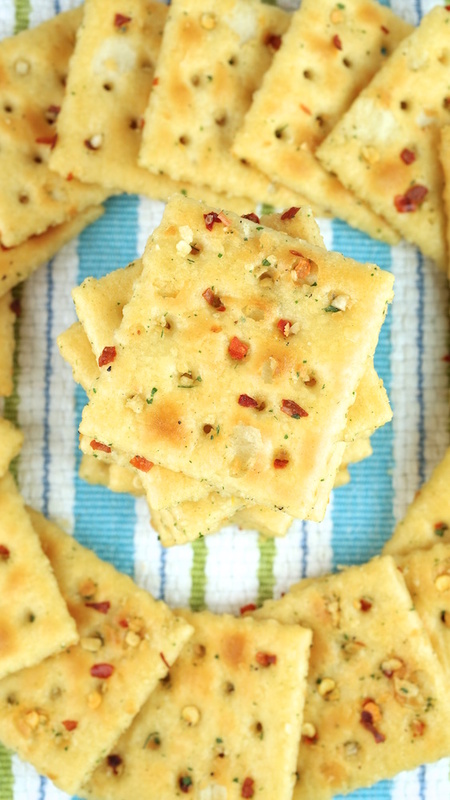 I made them with mini-saltines … everyone in my office LOVED them! Quick, easy & delicious! I got a little creative and substituted olive oil and butter for the bland canola oil. And, I used your suggested oyster crackers (wow, those are a little pricey! $3+ for 9 oz). They tasted great, if a little salty from the Ranch powder. Next time, I will use the same oil mix but forego the Ranch powder due to its high salt content and use typical Ranch herbs, along with the garlic powder and chili flakes. A little tweaking and these will be addictive! Do you have to use unsalted crackers ? No, but you may find the salt to be too much combined with the other ingredients. How do I store leftovers? Just tried this and it was amazing! I’m glad you liked them, Alyssa! We just store them in ziploc bags. It is not the first time I’ve been asked that! Surprisingly, no, the crackers do not get soggy. Saltines, for whatever reason, retain their structural integrity. This is great– I don’t love saltines, but every time I need them for something, I’m always frustrated that they only come in massive boxes! What a great way to use up the leftovers! Oh my goodness! I can just imagine how addicting these delicious saltines are. Seriously. I love saltines anyway, but gussy them up like you did. Hold me back! hmm… seems like a simple and tasty snack! My son made some fire cornflakes this summer and the they were surprisingly awesome. I can’t wait to show him this recipe! Cornflakes?! I would have never thought of that but it sounds like a genius idea! I will have to give it a try. I have done something similar to this with pretzels, and oyster crackers, and I have been wondering about flavoring Saltines. I always finished my pretzels, or oyster crackers, in the oven. I read above that they don’t get soggy. I’m surprised, but I love that I don’t have to do that extra step. I have such a love/hate relationship with these – they’re so good, but so addictive that I eat nothing but these until they’re all gone! A great snack to put out at a party. I shall try this for the tea party tomorrow!! I’ve made these before – such a fun, surprisingly addictive snack! These would be amazing next to a plate of cheeses for the holidays. Thanks for sharing! So simple to make for such a great result! I can easily imagine they can become addictive! Shouldn’t the crackers be put in the oven say about 325 degrees for a few minutes? This is a no-bake recipe, but if you’d like to put yours in the oven, feel free! 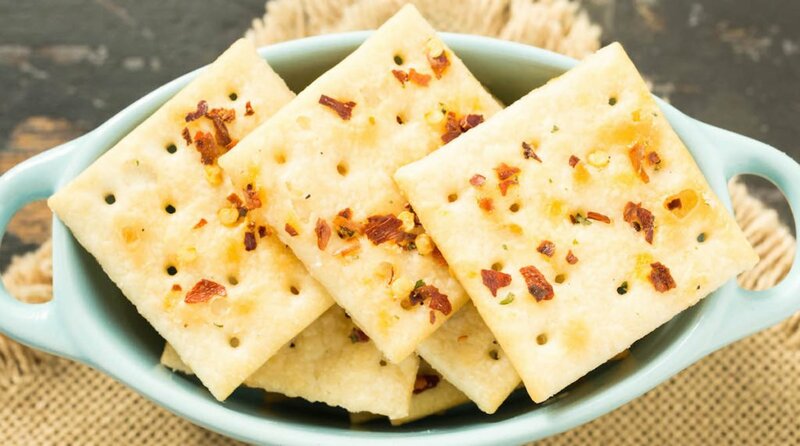 What is savory saltine seasoning? Inquiring minds must know!! Saltines on Steroids! I love it. I bet they would be entirely addictive and also great on a cheese platter. You did not put temperature to cook crackers???? Brenda, this is a no-cook recipe. can vegetable oil be used rather than canola? Vegetable oil should work just fine. Let me know how it turns out! What is the calorie count for these. Recipe says 188. For how many? There are 20 servings if you make this recipe as directed with one box of Saltines. These crackers are dangerous. You can’t eat just one. Oh no. All I can say is. They are flipping goooood! I make these but use oyster crackers and fiesta ranch seasoning with red pepper flakes for a kick and no garlic powder. They go great in chili for an added spice. I use red pepper flakes and taco seasoning instead of ranch dressing. Yummy! Then do you bake these fire crackers. It says bake time 30 min. But no oven temp. showed. I know someone who used townhouse crackers. Even more dangerous. Try cheese its mixed in with the saltines. I used the reduced fat. Pretty darn good. Made these earlier today! Yummy!